In the Bhagavad-gita, Krishna talks at length about the "three modes of material nature." These are subtle forces that influence our behavior as well as every aspect of our physical, mental, and emotional world. The Sanskrit term for these forces is guna, "rope," and the Gita explains how they pull us to act in various ways, even against our better judgment. The fourteenth chapter of the Bhagavad-gita contains elaborate descriptions of the modes, their symptoms, how they affect us, and ultimately how to become free from their influence through the practice of bhakti-yoga, or Krishna consciousness. 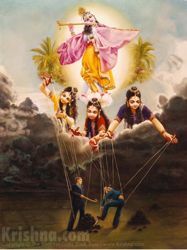 The painting depicts the three modes of nature as puppeteers controlling our actions. - how the modes of nature influence our thoughts and actions, whether we like it or not. - understanding the gunas described in the Vedic literature provides a unique perspective on God, the world, and ourselves. - Are we free? Or are we—like the behavioral psychologist B. F. Skinner’s rats—simply products of our environmental cages? - Lord Krishna gives clear lessons on how material nature controls us through three modes and how to rise above them. "Material nature consists of three modes – goodness, passion and ignorance. When the eternal living entity comes in contact with nature, O mighty-armed Arjuna, he becomes conditioned by these modes." "From the mode of goodness, real knowledge develops; from the mode of passion, greed develops; and from the mode of ignorance develop foolishness, madness and illusion." "When the embodied being is able to transcend these three modes associated with the material body, he can become free from birth, death, old age and their distresses and can enjoy nectar even in this life." "This divine energy of Mine, consisting of the three modes of material nature, is difficult to overcome. But those who have surrendered unto Me can easily cross beyond it. "